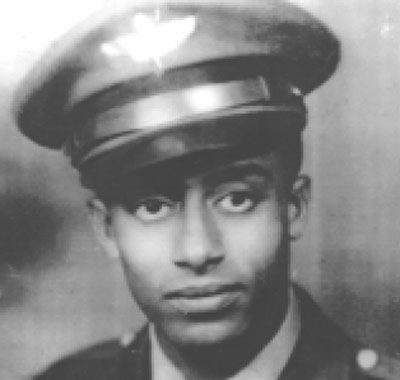 William P. Armstrong (1924- 1945) was a Tuskegee Airman/Fighter Pilot. September, 1944: Evelyn Armstrong James remembers it as if it were yesterday. She and her mother (also named Evelyn) had just completed a long and difficult train trip from Providence to Tuskegee, Alabama. But the trip was worth it; on Friday, September 8, her brother, William P. Armstrong, graduated with Class 44-H from the Tuskegee Flight School. He received his pilot wings and a commission as a Flight Officer in the Army Air Corps. Bill Armstrong was born on Oct. 30, 1924 in Washington, DC, and along with his mother and sister moved to Providence where his grandfather lived. His mother eventually remarried, to Nelson F. Venter, and the family lived on Codding Street in Providence’s West End neighborhood. After attending Kenyon Street Elementary School and Gilbert Stuart Junior High, Armstrong entered Central High School where, according to former American Legion State Commander Robert Miles, an old school chum from those days, Armstrong excelled academically and was a member of the student council. Standing about 5’10”, Armstrong was thin, handsome and outgoing. His avocation was singing; according to Miles, he had a beautiful tenor voice. His family attended the Episcopalian Church of the Saviour on North Main Street, which sometimes hosted afternoon teas for teenagers. Musical groups offered impromptu entertainment, and Armstrong was always asked to sing a solo. He graduated from high school in January 1943, and wanted to become a lawyer. 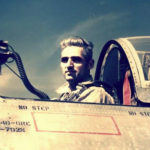 Because of World War II, military service had to come first, and he chose the U.S. Army Air Forces. 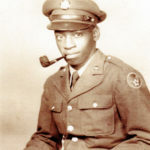 Armstrong was accepted for training as a military pilot at the Tuskegee Institute in central Alabama. On Sept 8, 1944 he graduated from Tuskegee Army Flying School and became a Flight Officer in the 301st Fighter Squadron, part of the elite 332nd Fighter Group. German planes were shot down, but two Mustangs were also lost. “After fulfilling our mission, the 301st broke away from the rest of the group and flew straight down the Danube River,” Flight Officer James H. Fischer said an interview published in Tuskegee Airmen: The Men Who Changed a Nation by Charles E. Francis. In his report, 2nd Lt. John E. Edwards said he saw one P-51 Mustang hit by fire from an enemy plane, and dive to the ground. In 1949, American Legion Post #69 was renamed the Lieutenants Armstrong- Gladding Post. According to Maria DeMento of the Grace Church Cemetery Project, Armstrong’s stepfather, Nelson Venter, was determined to find Armstrong’s remains. Pressuring military authorities finally bore fruit; the flier’s remains were finally located. He had been buried in Austria, and Venter arranged for the body to be returned home. In March, 1950, Armstrong was buried in the family plot at Grace Church Cemetery in Providence. For his service, Armstrong was awarded a Purple Heart and an Air Medal. As a member of the 332nd Fighter Group, he was also awarded a Presidential Unit Citation.